SpaceOut was featured in today’s Sunday Newspapers (Australian Wide) in the highly regarded Value Hunter section. 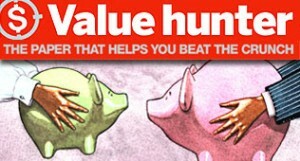 Value Hunter is a consumer advocacy column that has been appearing since the beginning of 2009 in all News Ltd Sunday newspapers. The Value Hunter Column provides useful, simple, and practical information about how to make and save money. Following is a transcript of of the Value Hunter Column – “Cash in your Spare Space” , by Jane Hansen – published Sunday 30 August, 2009. IF the guest bedroom is lonely, or the kids have flown the coop, or the shed is empty, why not put that spare space to work? Roger has a two- car garage in Brisbane’s north side, but with only one car in the family, he decided to offer the space for rent on the website Spaceout, and it’s now earning him $180 a month. “It’s money for nothing because I had the space. A silent tenant that won’t give you grief,” Roger said. The tenant has gone overseas and wanted to store belongings. “Commercial storage was going to cost more than the value of the belongings, so it’s a win-win situation for both of us,” Roger said. Commercial storage is quite expensive with three- metre by 2.6-metre spaces renting out for up to $300 a month in most capital cities. In Sydney, Ian Devlin has a two-bedroom investment unit, with a friend renting just one room. He heard about the site and decided to rent out the other bedroom as storage for $280 a month. Again, a young traveller was heading overseas for six months and had some antiques and sentimental belongings. “It’s great, I don’t have to deal with multiple tenants, no-one else is using the phone or the electricity, or heating, it’s the perfect tenant,” Mr Devlin said. Earlier this month a Victorian Department of Transport report found that 70 per cent of Melbourne homes had an empty bedroom – 1.3 million of them. “Home owners could rent out a small bedroom for $200-300 a week, because commercial storage charges up to $400 for the same space,” Spaceout co-founder Andy Henderson said. Colliers International recently released their 2009 survey of car parking rates across 140 parking districts in the world. With a median parking rate of $733, Sydney’s CBD was the most expensive in Australia, and the fifth most expensive in the world. Surprisingly, Brisbane was number two in Australia and seventh worldwide, at $660 a month. Liz Edwards was paying $35 a day, or $700 a month, for her car park in Brisbane’s CBD. “One night I left the car in over night, and it cost me $70,” Ms Edwards, a recruitment executive said. That experience made her Google car spaces, and up came Spaceout. “I found a car space for $200 a month, it’s someone who lives in a city apartment who doesn’t have a car, but a car park, so it’s secure,” Ms Edwards said. In Melbourne and Sydney, there are car spaces available online through SpaceOut for as little as $120 a month. How Many Folding Bikes Does It Take To Fill A Parking Space? Money for Jam – Coming Soon ! !